Tile creates a great durable and easy to care for the finish on many surfaces in the home; from floors, to shower surrounds, to a kitchen backsplash. There are so many different ways to create a stylish look with tile. some people like to bump that stylish look up with the use of colored grout. Though tile and grout provide high style, your grout lines can become very dingy and much less appealing over time. When you begin to notice some grout grunge you will want to get out some cleaner and scrub away. When your grout gets grungy Mandy people grab for the standard bleach and a toothbrush to get their grout lines looking white and sparkling again, but it won’t work for colored grout. The purpose of colored grout is the color, and bleach will ruin that color. 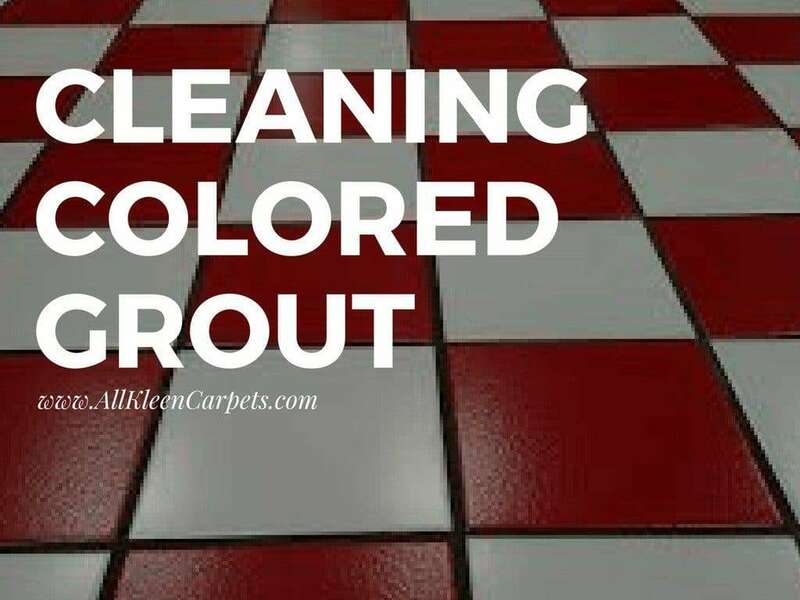 Here are some great ways to clean your colored grout. There are a couple of different homemade solutions you can try to get colored grout looking new again. We recommend trying the mildest solution first until you find the one that works for you. 1. Vinegar- start with a simple solution of vinegar and water in a spray bottle. Apply it directly to the grout and let it sit for a few minutes. Gently scrub away grime with a small brush like an un-used toothbrush. 2. Baking Soda- another great and mild cleaning agent you probably already have in your cupboard. Mix a paste of baking soda and water and apply to the grout it makes a great scrubber. Take a sponge and wipe the grime away. 3. Hydrogen Peroxide- dilute some hydrogen peroxide with water and apply it to grout lines. You may want to test a very small unseen area of the grout lines before applying to the whole area. Hydrogen peroxide can act as a bleaching agent and you do not want it to pull the color out of your grout lines. If your test area comes out alright and you clean all of your grout lines make sure not to keep the hydrogen peroxide on for too long. 4. Oxygen Bleach- this is a strong cleaner that allows for very little scrubbing but you want to use it sparingly. The chlorine can wear down grout lines over time. The easiest way to ensure your grout always looks its best and is clean and sanitized is a yearly professional deep tile and grout cleaning and sealing. A professional cleaner will come in with high powered equipment to reach the deepest parts of the grout that home cleaning can’t reach. Once the grout is looking cleaner than you thought it could, have your professional cleaner seal the grout. Professional grout sealing is a protective coating that helps to prevent staining. It is not a guarantee against staining as much as a barrier to prolong substances from soaking into the grout giving you a little extra time to clean the grout. Yearly professional cleanings will help to make regular at home cleanings easier as well as prolong the life of your tile and grout.